Creating personal change starts when you challenge views of yourself. If you believe that you will cultivate better relationships by being more securely attached, you may decide to embark on a journey to earn secure attachment. It is no easy task and it requires dedication and soul-searching. Just remember you are human so don’t be hard on yourself and enjoy the ride. It all starts with self-awareness, and it is followed closely by self-compassion. 1. Be aware of your emotions. Can you identify your own emotions beyond the most basic, simplistic ones? How sophisticated is your emotional vocabulary? Are you able to pinpoint emotional nuances, as an artist would differentiate the subtle color differences in his palette? If you are not quite certain, a good way to get that going is working with a wheel of emotions. Choose a situation that caused you a strong emotional reaction – positive or negative – and take it from there. How did it make you feel? Start with basic ones: happy, sad, angry. 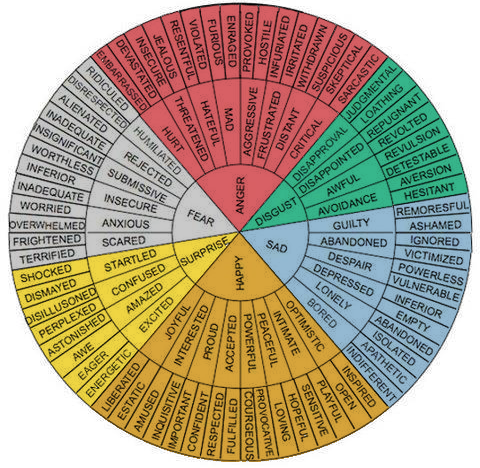 Then dive deeper, using the wheel of emotions to describe, in detail, how you felt about it. 2. Differentiate thoughts from emotions. We often draw conclusions based on what we feel, rather than what actually happened. That bad report at work left you feeling a bit down? 3. Accept and befriend your emotions. We tend to repress feelings that are socially labeled as negative. By wrapping our mind around the idea that emotions such as anger and sadness, are not shortcomings or character flaws, we come to befriend them, and accept them as part of the human experience. Allowing ourselves to feel our feelings while remembering that emotions are fleeting, but our actions and words are not, is empowering, and can greatly aid us in deciding how to go about them, creating positive, healthy relationships. Once you achieve that, self-compassion follows, naturally inspiring you to pursue inner growth in the long run. After all, being aware of what you feel validates your own human experience. 4. Question your own biases. One of the reasons why creating personal change is easier said than done is due to something called confirmation bias. In an ideal world, we would be able to think, “Yes, I am worthy. Yes, I am enough,” and then magically, we would feel worthy and enough. But it doesn’t work quite like that. From birth, we are bombarded by information that comes from our environment. That feedback from people we interact with in our early years helps shape and reinforce our views of ourselves through life. Sometimes, the message is positive. Sometimes, it is not. In both cases, as adults, we tend to lean to thoughts and behaviors that confirm that bias, those sometimes-warped views of ourselves, and literally ignore evidence to the contrary. That is confirmation bias in its full force. So, questioning your own biases comes in handy when promoting your own personal change. It is not enough to just think, “I am worthy”, but also search for evidence to back it up when your mind is trying to convince you of the contrary. It is worth reminding you, once again, to be kind to yourself. That frantic desire to change and be better for your relationship could be, yet, another facet of insecurity. We want to improve, but we also want to be proud of how much progress we’ve made so far, and value the qualities we already have in us. As much as we’d like to think so, being securely attached is not the only way – and even less so the right way – to have thriving, fulfilling relationships. Being in a relationship with someone who complements your style can be just as rewarding. That said, if you tend to be a bit more preoccupied or avoidant, being in a relationship with someone who is securely attached may grant you a good balance. Two people with preoccupied styles could make the most of it, by having a degree of understanding and empathy for one another and being in the same wavelength in terms of how close they would like to be. In relationships where both are more reserved regarding their emotional world, preferring to keep a safe distance, there could be cherishing of one’s individual space. Thus, a thriving relationship between like-minded individuals would take shape. The one potentially destructive relationship pattern is the one between anxiously attached individuals and dismissive ones, which would possibly create the pursuit-withdrawal dynamics. Remember the lighthouse in the last post? Earning secure attachment doesn’t even have to start from a romantic relationship. Someone you trust, such as a friend, a therapist, a clergy person, may provide you with that imagery, and therefore help you cultivate and nurture a healthy, secure attachment.